Since you’re not canning this jam, you can take any liberties you like with the recipe. (Canned foods require a certain minimum level of acidity for safe storage, so always use a modern canning recipe if you’re going that route.) I started with three kinds of cherries, sugar, and half a lemon, then added a splash of almond extract at the end. Cinnamon or vanilla would also be excellent additions to this jam. One Jar of Cherry Jam: Combine 3 c. roughly chopped pitted cherries, 3/4 c. sugar, and the juice of half a lemon in a small non-reactive pot. Bring to a cheery boil and maintain the boil for at least 5 minutes, stirring constantly. If you cook the jam for a shorter time it will have more of a true cherry flavor, but if you cook it longer it will thicken more. Your call. Taste the jam and add more sugar, lemon juice, or other flavorings as desired. (I ended up adding a few more Tbsp. sugar, more lemon juice, and a few drops of almond extract–but each batch will be different depending on the cherries you start with.) Keep the jam in the fridge and use it within a week or two. Yield: a little less than two cups, just enough to fill a reused peanut butter jar. What a great idea! I never would have thought to make just one jar for immediate consumption. I used to make apricot jam this way, but would cook it a lot longer. Cherry sounds delicious. Yum!! Have you read/looked at any of Christine Ferber’s jam/jelly recipes? I’m salivating just thinking about them. Although I have none of the canning accoutrements, reading her cookbooks are enough to make me float on an apple jelly cloud. 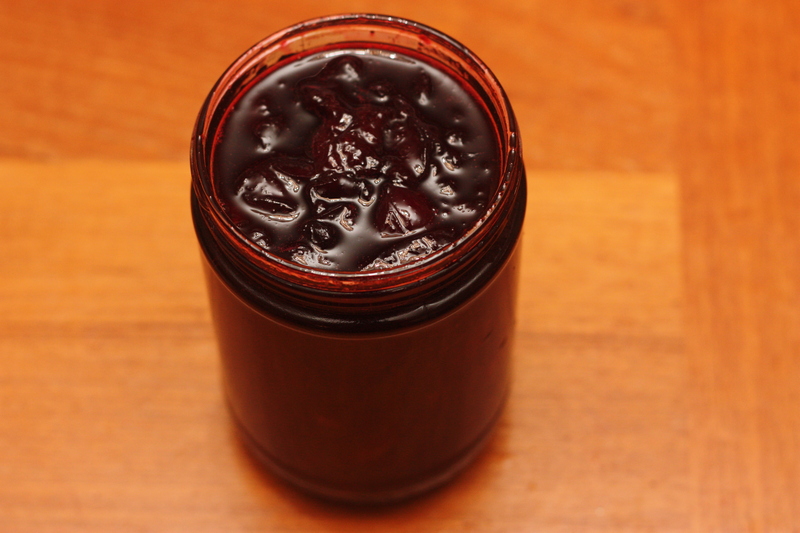 And I’ve made her strawberry-black pepper jam (refrigerator-style). Yum. No! I just requested Mes Confitures from the library (and while I was there, I also requested Mes Tartes, just to cover my bases). :) If strawberry-black pepper jam is any indication, I’m going to love her recipes. Thanks for the recommendation! I love cherry jam. Thanks for sharing the recipe! Man, even though I do can things, I never make jam! We just don’t eat enough of it to make a canner’s worth. Obviously tiny batches like this are a great idea! “Use within a week or two..” umm, yeah. Pretty sure that would be more like “try not to shove it all in your face at the same time.” Looks fantastic in the best way – simple enhancement of spectacular natural flavors. Thanks once again. I’m in the freezer camp. Because I’m lazy and because it’s so hot here in the summer (especially this year) that a hot water bath is just out of the question. But I also like the tiny, tiny batch thing. This looks great. Sooooo jealous right now of all you West Coast folks in cherry country! I’m totally old school about canning. I do the whole turn-the-apartment-into-a-sauna, boil-the-jars-fill-the-jars-boil the-filled-jars-schtick. The jams are always incredible. I make a ton at a time too. But it is such an affair that I dread the whole process and haven’t canned anything in two years. This post inspires me to say it’s okay to make just one or two jars to enjoy right away. No need to be a little jam squirrel! Thanks, Emmy. I feel liberated! Great idea! You helped me salvage a few apricots and a peach from last week’s CSA that were starting to look sad. The almond extract goes nicely with them. We get that huge box and this was the first time I had any left over from one week to the next–hopefully I’ll end up with apricots another week! I love the idea of making just one jar of jam. What a gentle way for a novice like me to step into the world of jam-making! Your cherry jam looks divine, and I bet it tastes out of this world. Good idea to add almond extract, I had noticed before that really brings out the cherry flavor! My kind of jam, I’m too intimidated by big canning batches!